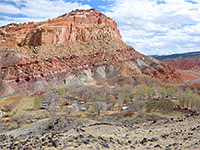 The two mile trail to an overlook of the canyon of the Fremont River is one of the most strenuous of the dozen or so maintained hiking paths in Capitol Reef National Park, climbing 1,000 feet from its start point near the north end of the scenic drive, and ending at quite a spectacular viewpoint, with a 360 degree panorama over the canyon and its surrounding cliffs. 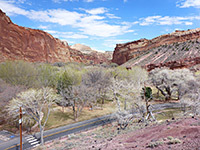 The views extend both upstream - along the deepest part of the canyon, as the river winds through a confined gorge in some places just 40 feet wide at the base, with the high slopes of Boulder Mountain visible beyond - and downstream, back towards Capitol Reef, where the slopes along the lower part of the gorge are backed by the multicolored cliffs and ridges of the Waterpocket Fold. Most of the climbing occurs at the start and at the end; the middle section of the path crosses a relatively flat and rather barren volcanic plateau, and the scenery is little changing along the majority of the whole route, as the canyon is properly viewed only right at the end. This, plus the steepness and the somewhat hidden trailhead are the reasons why not so many people hike the trail, especially during the heat of summer, but the final overlook makes up for the lack of variety en route, and the barren slopes at the beginning. 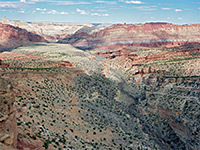 The canyon is 8 miles long - cliffs rise up steadily just west of the reef, becoming to 1,200 feet above the river after a couple of miles, but then gradually recede, so that when the river is crossed highway 12 to the west, the walls are just 150 feet high. Like Sulphur Creek, its similar tributary to the north, the gorge can be followed at water level, but only at times of low flow. Panorama from the overlook. Full screen version (25 mb). 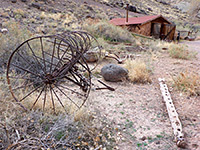 The unsigned trailhead for the Fremont Gorge Overlook Trail is at the west end of the parking area beside the blacksmith's shop, one of several buildings associated with the old settlement of Fruita. 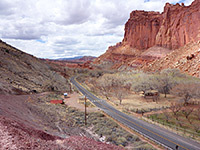 This location is along the scenic drive, 1.7 miles south of the junction with Hwy 24. The blacksmith's shop contains many original items, including a Power Horse tractor, and is situated just across the road from one of several orchards in the vicinity, plus a picnic area and the Ripple Rock Nature Center. 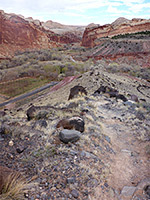 The trail begins along a gated vehicle track, marked 'hiking route', up the side of a completely unvegetated slope of purple/grey clayish rocks from the Chinle Formation. 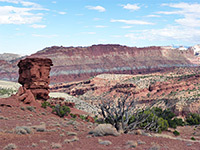 It soon rises above the orchard, looking across to the west side of Capitol Reef and the switchbacks at the start of the Cohab Canyon Trail. The track rounds a corner, above the park campground, where a sign points to the actual path, on the right, signed 'viewpoint, 1.8 miles'. 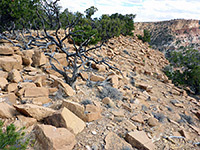 This heads up a slope sparsely covered by grass, yucca, and cacti, to a ridgeline, which is followed westwards, climbing quite steeply to the edge of a level mesa, an exposed and often hot location. 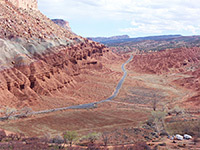 The land looks similar for some distance ahead, with just a few patches of small trees to the interrupt the general emptiness, though the path is aiming towards higher, angled, reddish slopes of the Moenkopi Formation, which have more features, and more vegetation; the base is reached after 1.3 miles, about half an hour's walking, during time which the main points of interest are the gradually better views of the dramatic cliffs that surround the plateau. 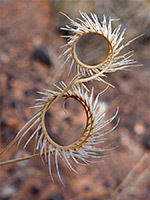 The reddish slopes are home to a limited selection of wildflowers, and some that do grow here remain small, reflecting the low soil quality, though there is certainly more variety than on the plateau. 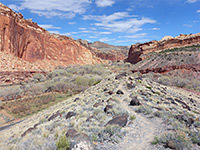 The trail rises steeply again, past a red pinnacle, while coming ever closer to the Fremont River canyon, which has remained out of sight until now. The last part of the trail does run along the rim briefly, then veers away, ascending less sharply, to the final overlook, marked by a big cairn. 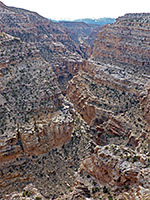 The rim continues climbing ahead, but this is the best overlook, encompassing both the deep middle section of the canyon, and the colorful slopes around the lower end. The trail once continued another 1.8 miles, climbing a further 600 feet, but this section is no longer apparent. The rim is formed of fractured, weathered rocks of light brown sandstone/mudstone, good habitat for the clump-forming yucca angustissima.